The Gujarat Fortunegiants came in with a bang on their debut season in 2017. A solid performance in every match and brilliant teamwork took them all the way to the finals of PKL season five. Unfortunately, the Gujarat Fortunegiants were unable to cross the final hurdle and were defeated by the highly successful Patna Pirates. On the other hand, the Bengal Warriors have been part of the PKL since season one and season five saw their best finish in third place. The Bengal Warriors have spent far too long in the shadows of the contenders. Their consistent performances over the years have enthralled viewers with some fantastic matches and daring skills. The Bengal Warriors vs Gujarat Fortunegiants match is certainly not one to miss, as both teams are looking to cross the final hurdle and lift up the PKL trophy. Let’s have a closer look at the players, the expected strategy, strengths and weaknesses of both teams. The Bengal Warriors is primarily a raider team, with big names like Maninder Singh, Mahesh Goud, and Jang Kun Lee will be the star raiders. 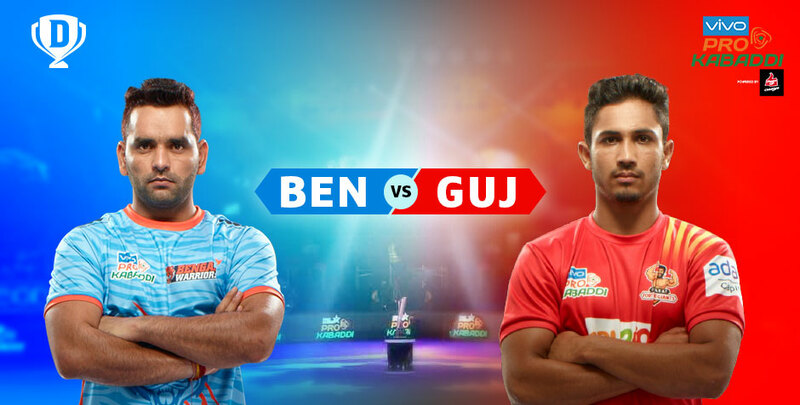 Among Gujarat Fortunegiants, Maninder Singh is seen as the master raider who can turn the tables in a Bengal Warriors vs Gujarat Fortunegiants game. Raider Mahesh Goud returns after a stint with the U.P. Yoddhas and the champion Patna Pirates team. Mahesh is a seasoned PKL professional and has mastered the skill of raking in points at every match. There are hopes that he will achieve the same in future Bengal Warriors vs Gujarat Fortunegiants matches too. The absence of Fazel Atrachali in the Gujarat Fortunegiants squad will take a toll as his leadership skills and knack for the game are highly valuable to the team’s success in Bengal Warriors vs Gujarat Fortunegiants matches. The Gujarat Fortunegiants are known to be aggressive from the start and can swiftly take charge of the game putting the other team in catch-up mode. But this is the speciality of the Bengal Warriors as they are known to make a late charge and surprise their opponents. Defender Sunil Kumar takes over as captain of the Gujarat Fortunegiants this season. His impressive skills and prior experience with the Patna Pirates will prove useful during intense Bengal Warriors vs Gujarat Fortunegiants matches. Team Gujarat shall be led by Sukesh Hedge who is known for his expertise in ‘Do or Die’ raids. Giving Sukesh Hedge a tough competition in ‘Do or Die’ raids will be K. Prapanjan. He had an impressive season with the Tamil Thalaivas in season five and now with team Gujarat, he is expected to continue the success streak during Bengal Warriors vs Gujarat Fortunegiants. Korean raider Dong Geon Lee is another buy from the Tamil Thalaivas and starts his second season with the PKL. Joining the Gujarat Fortunegiants, his international experience and supreme agility will come into play to help win Bengal Warriors vs Gujarat Fortunegiants matches for his team. But the journey won’t an easy one as fellow Korean Jang Kun Lee of team Bengal is one of the successful overseas raiders in PKL. Gujarat Fortunegiants vs Bengal Warriors score in season five was a 42-17 as Gujarat annihilated the Bengal team to head into the finals. In the future Bengal Warriors vs Gujarat Fortunegiants matches, team Bengal will surely be working towards turning the tables. Both teams have a mix of experienced big names and new talents, the Bengal Warriors vs Gujarat Fortunegiants clash is expected to see Gujarat raiders to dictate play but they won’t have it easy as the Bengal Warriors are capable to keep up on the scoreboard. The match can go either way and it’s most likely to be the team that has the scoring momentum on their side. As you step in to prepare for the upcoming matches, Check out the full Bengal Warriors vs Gujarat Fortunegiants result from previous seasons and pick your learnings from the showdowns. It is recommended that you research well and make your picks at the earliest on the Dream11 website or app. This would give you enough time to analyse and shuffle players much before the matches begin. Make your picks before every game and be rewarded for your sports strategy skills. Play solo contests or check out the mega-contests to help your hone your online strategy skills. Get started with Dream11 today!